1. I just returned from Santa Rosa where I had my 3-month check-up with my rheumatologist. New blood tests to review. I’m happy to say all my vitals were excellent, my blood was good except for low platelettes and lymphocytes and the presence of the scleroderma antibody. Since my last visit, I have gone from 97 pounds to 102.5. And, best of all, my oxygen level was 99%. Wow! Rosa, who took my vitals, said she rarely sees readings that high. Last time, I was 98%. 2. I’ve been working dilgently on Eternal River, Volume III. Deadline is the end of this month. Deadlines remind me of running before the wolves, throwing meat over my shoulder to keep from being devoured, but they propel me towards my desired goal, so they’re good. It’s an exciting book because fact is stranger, and often more surprising, than fiction, and this book is comprised of true events. I love it! 3. 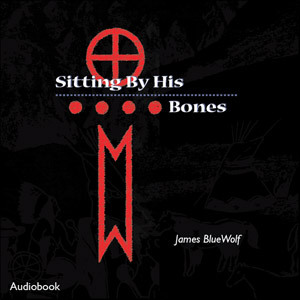 A new arrival from Earthen Vessel’s audio division — Sitting by His Bones audiobook. It’s Lake County Poet Laureate, Emeritus, James BlueWolf, reading his poems in his sonorous, mellifluous voice. Click on the cover to hear James read some of his poetry. 4. All of my fruit trees are bearing like crazy. In the twenty years I’ve lived here, the plum in front has never given so much fruit. Oddly, the birds didn’t eat any. 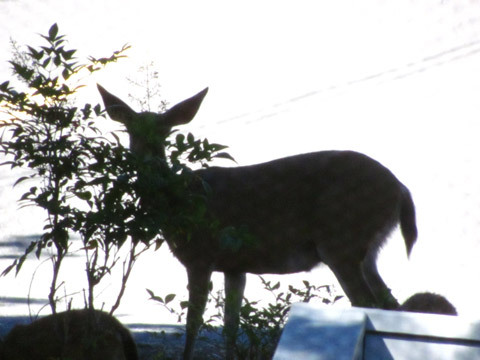 There was nothing wrong with the fruit, evidenced by the deer who have had a feast on whatever fell. My neighbor, Cathy, climbed a ladder several days in a row to pick them for me. She had plenty, too. How delicious and nutritious to pluck them ripe from the tree! 5. This year is turning out to be wonderfully fruitful as well. I didn’t expect it, considering how bleak February looked. But, as the Lord told me, the first thing out of bare branches after winter is blossoms. Then comes the fruit, sweeter and more abundant because, during the time of waiting, roots have gone deep. So wonderful to hear this positive update, Carolyn! As I read, I became more thrilled at each paragraph because I “heard” your excitement. Like your doc tells you, “Keep doing what you’re doing” so that we can hear more of your exaltation when you post here. Glad to hear things are going better for you! Hope everything goes as you want and deadlines are met. I’m currently working on getting my latest book (which is currently only available on Kindle) out in print form. You are, indeed, an inspiration to us all! Congratulations on the good news of your tests–with your positive thinking, you are bound to continue to improve. 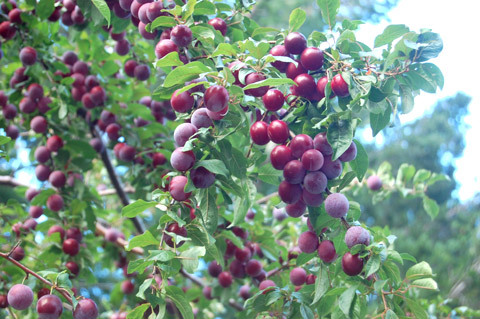 The plums sound wonderful. I’d be happy to pick some for you if I could keep some. Book and health sound wonderful. It’s good to see you walking in the neighborhood. What a wonderful way to end the week by hearing all of your good news! I’ve been flooded with more work than I can handle & have actually had to turn down a workshop in Singapore & 2 consultations in the last month. The end of this month through mid-October will be quite busy for me & I had to smile when you mentioned deadlines because it seems everyday there is another work-related task to take care of & sometimes several tasks due on the same day! But I give gratitude for having a job I’m so passionate about as I know you do too…it’s part of what keeps us moving upward & onward!